The summer shone beat down on bony backs. 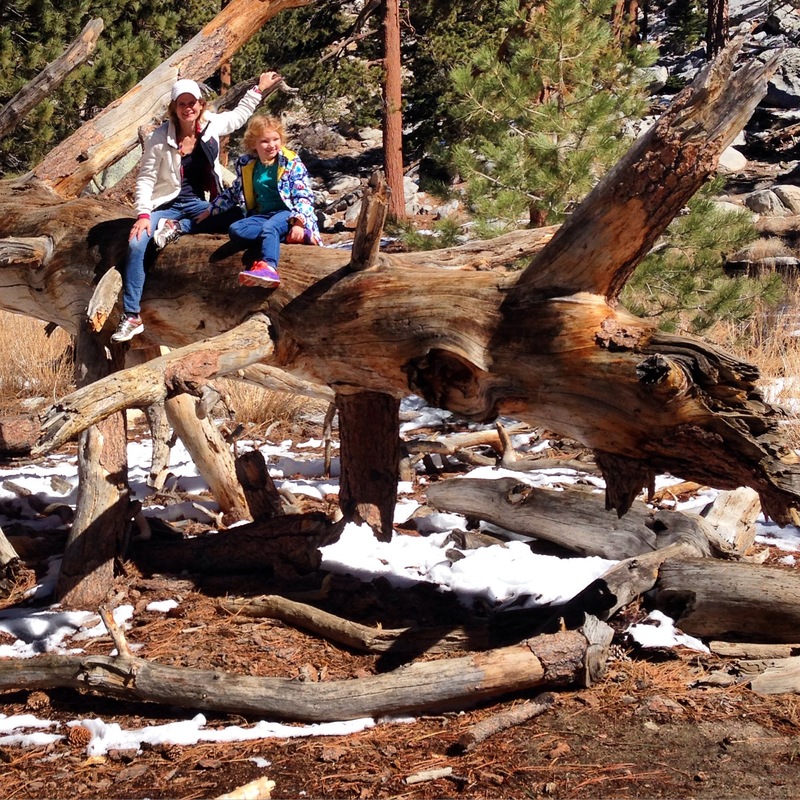 San Jacinto Wilderness State Park, Long Valley. 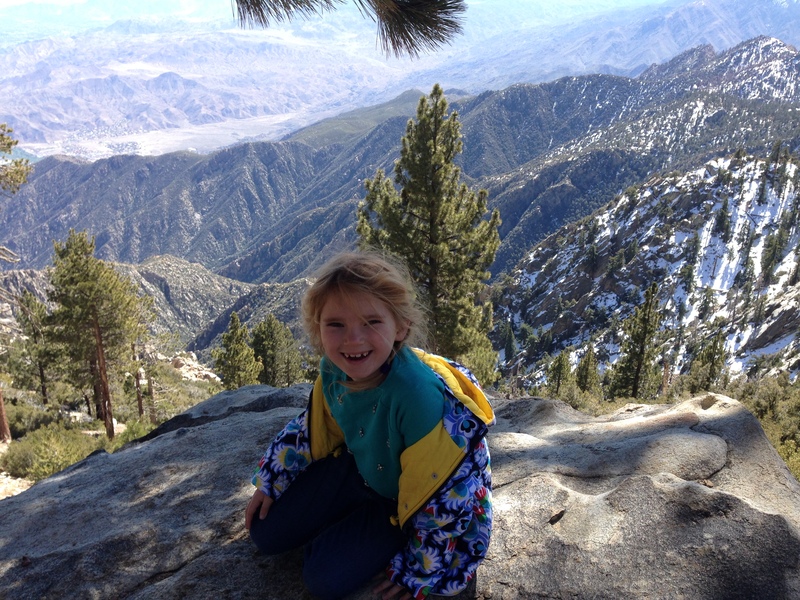 Once at the top station of the Palm Springs Aerial Tramway, my dad, Katie, and Eric and I took the Desert Trail to explore all five lookout notches. Taking in the alpine zone juxtaposed with the lower desert zones, we inhaled that crisp and essential mountain air, 8400 feet above sea level. 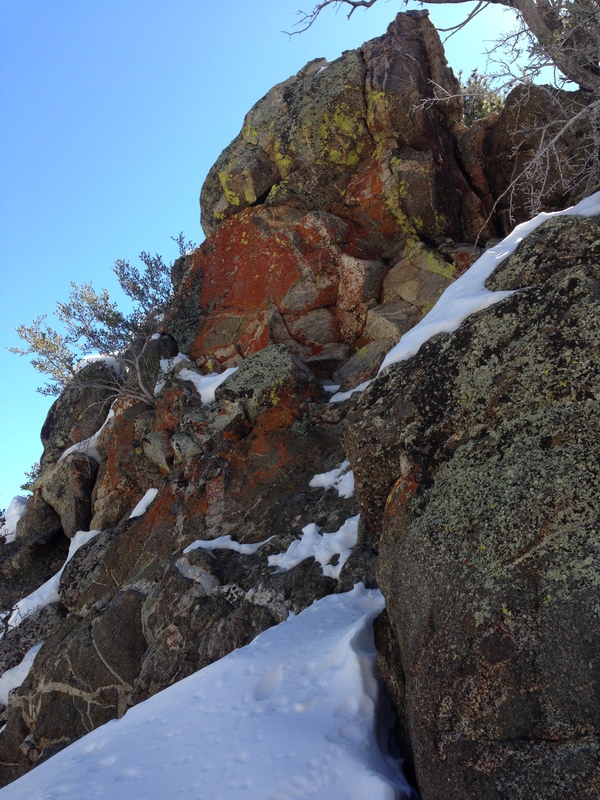 All day we crunched in snow and goat-footed ourselves over rocky outcroppings (we went off trail several times—shhh!). Much more snow remained this year, and the ranger at the Ranger Station cautioned one group of would-be hikers that the snow was so deep in parts (3 to 4 FEET) that they would not be issuing permits for certain trails today. Those fallen pines and juts of granite and snow make a kind of magical beauty that I could get myself lost in for life, writing, sketching, wandering, thinking. I found myself wanting to hike every day forever. Billions of years of passing time—everything that ever was, compressed in the memories of rocks. From deep within the Earth and now amidst the buttery vanilla scent of Jeffrey Pines, these rocks of violence begat their limitless beauty. Orangey red, green, and black lichen are Nature’s paints on the rock faces. Ever notice how very much the folds of green lichen evoke the twisty and folded matter of the brain? This enormous fallen pine from the other direction evoked to me a rather large insect on all of its legs. It is perhaps difficult to see scale, but we are somewhat high up in this picture, and it took some climbing to get here. Katie-girl made me proud with her bravery. Heaven is a seat on a pine tree, here and now, as the pine begins its long process of turning back into earth, to nourish new life. I used to climb trees all the time as a child. It’s been difficult to find climbing trees in my adult life, but perhaps it just means I need better eyes and places to search… If we’re lucky, we become what we were. Eric fancied these limbs as his “spaceship” and from there spun out an elaborate narrative of planetary exploration that endured throughout the rest of our hike. He was fearless and had to be reigned in a bit—I think there were moments where he would have hiked right over several edges and down into the untouched snow, or searched out the highest rocks and looked for the homes of the bobcats. 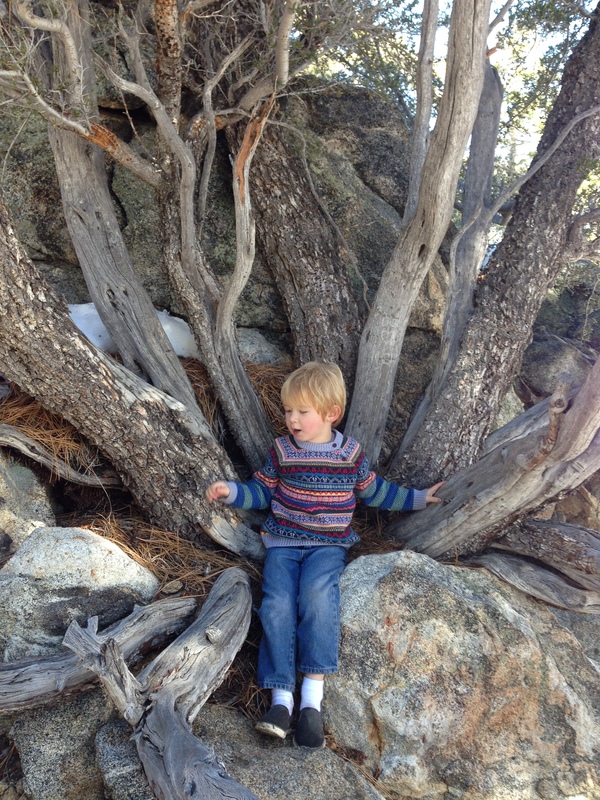 We had to keep calling him back, and I don’t like to do that—I want my kiddos to have a wide berth, get into and out of adventures on their own, wander and feel the contours of their range. However, I draw the line at safety. This person here is lured by beauty and just-around-the-bend and freedom in the landscape: he has my genetic imprint in this regard, no doubt. Thankfully, he is nimble and sure on his feet. What a treat to have my dad along this year, although we missed my mom, too. (She accompanied us last year). Dad, with his biology background, knows quite a bit about everything he sees in the natural world. He has a curious mind that engages the kiddos, too. We loved our time with him. Last year we went off trail and found a special crop of boulders that made a sort of shelter and hid us away: no one could see us, and we could see no one. We really got away from it all. At the time, we had lunch there and played house with my mom there. The kiddos had designated rooms in this rock structure, and we all collected items and made a sort of play kitchen there, pretending to make a stew. How often we have thought of this place over the last year, we cannot say. We often retell the story when we have bedtime stories (“The Grand Adventures of Katie and Eric”). We wondered if we could find it again today, and we did—in fact, they remembered the off-trail spot perfectly. 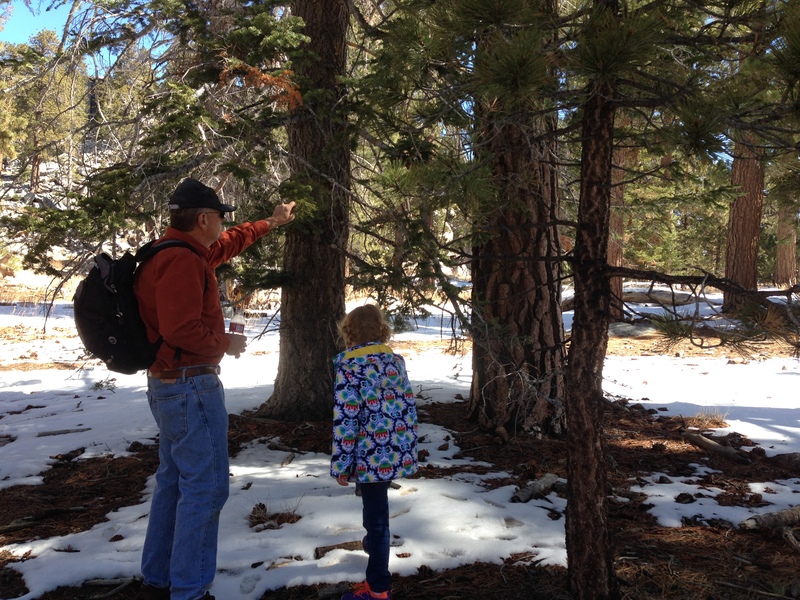 We went up there, had a snack, and then I was just going to lay on my back under the pines for a moment…the sound of the kiddos’ voices nearby playing, my dad helping to keep an eye on them. Suddenly and without intention, I was aware of something deeper even than sleep overtaking my body. I could still partly hear them all, but was partly asleep, partly adrift on the sound of the wind. At any rate, it was the most supreme rest and refreshment I have had for many weeks. I’d start to stir then would feel the sky on me like a blanket, as though my mind were floating on the day while my body lay on nothing but dirt and pine needles. It was the most comfortable of beds, despite the small rocks and needles; it was almost as if I could feel my body become part of that earth right there, no division between the two…and that while my body rested, my mind was still hearing and sensing and free. I still am not sure how much time passed there, moments of complete refreshment and oneness with the vast nature around me. 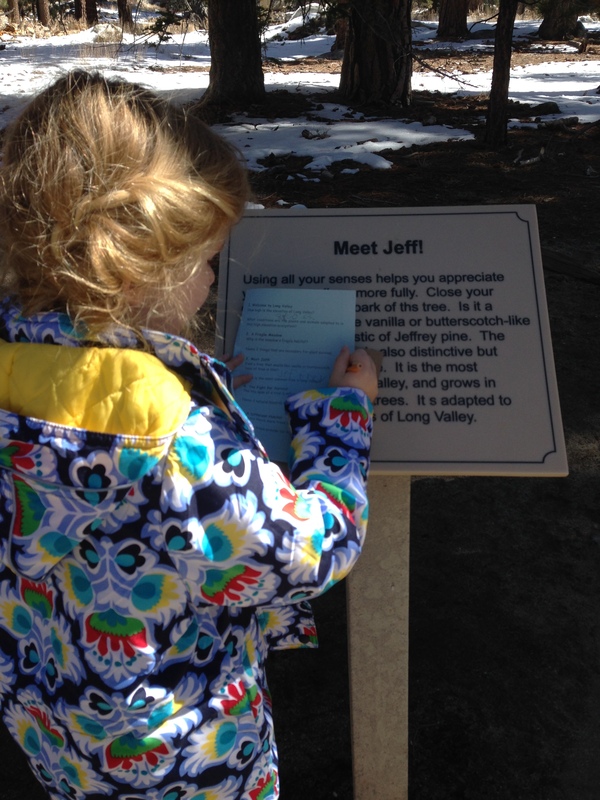 One of Katie’s pursuits today involved earning another Junior Ranger badge, as she did at Crater Lake. We spent time writing down some facts and answering questions. After all of our hiking, we turned in her booklet (Eric’s, too), and then we had coffee and hot chocolate at the Pines Cafe up at the top of the mountain center. Today began with a waning-gibbous-moon 4:30 AM base mile run (“base miles” for me mean between 4 and 5 mi at a comfortable pace), followed by 2500 yards in the pool. Home again by 6:55 AM, I had mostly dressed for hiking in the locker room following my swim, but I still had to get the kiddos up and ready. My dad was over by 7:30 AM, and we were in Palm Springs by 9:15 or so. We hiked for many hours, then came home… I then ran to the track, did a series of 660s at a solid sub-6:00 minute pace (5:47 or so average) to finish trashing my legs thoroughly (5K run at race pace on Saturday, 10 miles semi-speedy on raced-out legs on Sunday, rest Monday, speedwork today) one more time before taper starts next week for the 15K that’s coming up. What gets trashed, builds back up stronger, right? That’s been the game plan this year. I wasn’t particularly looking forward to the speedwork today after hiking on uneven and snowy terrain at altitude all day, but I’ve been pretty stubborn/tenacious about not missing, even scheduling life around those speedwork days the past couple of months especially. Hope the effort bears fruit! Regardless, I was reflecting today on how just 2.5 years ago, I could have made it through exactly none of these various exercise activities today, let alone all of them. I am grateful today for my health, for getting to explore around with my children and to play and to feel the wind in my hair when I run…to know how it feels to glide through water and breathe deeply…to feel that I can generate my own store of energy, so that I can pour that energy into savoring the world around me, trying to understand its many beauties and wonders. I am thankful to feel the vitality of the pine trees, to feel attached to the earth beneath my feet, to know that my cells will one day dissipate and become part of something else, a flow of energy and matter much more vast than I am. I would like to capture the feeling in the Foo Fighter’s “I Am a River” here in a quote. Unfortunately, when I try to quote it, the emotion doesn’t quite render in the words. You have to hear it in Grohl’s voice and in the drums and bass: so here is a link to it on YouTube. It is about many themes, but I connect most to the subtextual idea of an eternally flowing river, like the flow of energy and space. This song has been on repeat for me lately. I usually listen to it on the way to or from swimming, as well as at times like right now, when I should be in bed sleeping. Music that connects to the essence, though, can sometimes be more restorative and refreshing than sleep, I find.